Missing one or more teeth not only creates a less aesthetic smile, but hampers bite function and jawbone health. Southland Dental provides patients with long lasting solutions for missing teeth, allowing them to regain the comfort and appearance of a full smile. Whether you are in need of a prosthetic for a single tooth, or are hoping to restore the entirety of your smile through implant supported dentures, Dr. Lin and our team are able to help. Contact our practice today to schedule your exam and consultation for dental implants in Anaheim. Dental implants fuse with the bone of the jaw and are intended to last for a lifetime. To ensure the effective and predictable placement of the implant post, we work with oral surgeons and periodontal specialists. This method for placement ensures that patients’ implants will meet their personal needs for care. 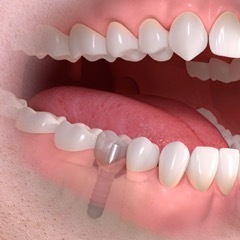 The specialists we work with also provide any necessary pretreatments prior to implant surgery. Whether treatment is dependent on bone grafts, sinus lifts, or comprehensive cleanings for periodontal disease, we help you receive the necessary care. Implant posts are made from titanium, a biocompatible metal that naturally becomes part of the jaw. Once placed, implants act as the root of the prosthetic and prevent bone resorption, preserving your youthful appearance and facial structure, and the comfort of a functional bite. Implant-supported restorations are fully stabilized by the fused titanium post and do not depend on the on the neighboring teeth to remain sturdy. Should your restoration wear down, break, or otherwise require placement, the same implants posts are used for support. To schedule your initial exam to determine whether you qualify for implant placement and restoration, contact Southland Dental today. We provide comprehensive dental care for patients throughout Anaheim and the neighboring communities.